Although Tibet has always had many accomplished female Buddhist practitioners, out of modesty few have emerged as prominent teachers. To have Jetsun Kushok Chimey Luding, one of the most respected female teachers of Tibetan Buddhism, among us is very auspicious and precious indeed. 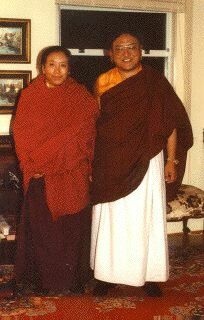 Born in 1938 as the sister of the current head of the Sakya lineage, one of the four main sects of Tibetan Buddhism, she received much of her training alongside her brother, His Holiness the Sakya Trizin, from such legendary teachers as Jamyang Khyentse Chokyi Lodro. Devoting herself to Buddhist practices from an early age, she completed her first retreat at age 10. Many more important retreats like Hevajra, Chakrasamvara and Vajrayogini were to follow, enabling her to become one of fewer than a dozen masters who are qualified to transmit the Lam Dre or "The Path that Includes the Results." Lam Dre, like Dzogchen, Ziji Chod and Kalacakra Yogas, is among Tibet's "Eight Chariots," or unique and complete systems of meditation practices leading to Enlightenment. Jetsun Kushok gave her first transmission of the Lam Dre, along with all the necessary empowerments, at age 17. In 1959, Jetsun Kushok left Tibet in exile and, by way of India, eventually settled in Vancouver, Canada with her family in 1971. Struggling to care for her children and make a living in a new country, she had to partition her time between working as a knitwear designer and keeping up her meditation practices, often to the point of staying up all night. At the repeated request of the Sakya Trizin, Jetsun Kushok selflessly started to teach in Vancouver in the early 1980's and now all over the world. Beloved by all her students, Jetsun Kushok is both strict and warm, transmitting only genuine Buddhadharma in the traditional way, seasoned by her pragmatic experience of practicing and working in the West. Having overcome life's twists and turns with diligence and perseverance, Jetsun Kushok is an inspiration for Buddhists, both male and female, who are looking to integrate the Dharma with their daily lives.